Ivory James sired Wild West Futurity qualifier Cm Once Ina Bluemoon. LOS ALAMITOS, CA�OCTOBER 7, 2017�Randy Dickerson and Nick Lowe's Cm Once Ina Bluemoon posted the fourth fastest time Sunday night for the the $129,100 Wild West Futurity at Los Alamitos Race Course. A total of 32 runners competed in the trials with the horses with the 10 fastest times moving on to the Wild West final on Sunday, October 29. 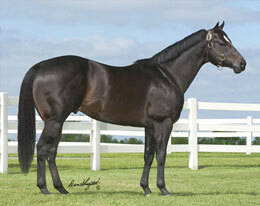 Conditioned by Monty Arrossa, the son of multiple stakes sire IVORY JAMES finished third in the fastest of four trials. Bred in Oregon by Randy Dickerson, the bay gelding was fourth in both the Bitterroot Futurity and the Oneida County Fair Futurity over the summer. Cm Once Ina Bluemoon has compiled (6) 2-1-1 record and banked $12,872. His out of the Jess Louisiana Blue mare Cool Blue Corona. For the complete list of qualifiers including times, sires, dams, owners, breeders, trainers and jockeys CLICK HERE.